Generation Gap is a spectacular section of the NF American that is then usually combined with the Giant Gap section to avoid a 2 mile hike up out of the canyon at the end (end of Generation, start of Giant). We also combined this with another 4 miles below this called the Chamberlain Falls section. We were getting a pretty late start as it is, and then I lost Tom's sleeping bag out the back of my truck and had to go all the way back to the take out again and get a spare out of Rocky's truck, that added another hour and a half and we finally got started hiking about 3. The hiking was super steep and arduous, but the forest was relatively cool (there was still a few small patches of snow at the start of the hike). After each brief rest, the weight of the kayak loaded with gear seemed twice again as heavy. The choice was to seal launch off the edge of the ledge into the boils below the falls, or portage the whole (otherwise runnable) gorge. We spent a long time thinking about the best way to launch as there weren't many ideal places. Both myself and Rocky slid off from the upper ledge, landing VERY flat. I landed off the 12-15 launch hard and flat enough that I saw a big white flash and had a stiff neck for a couple days, I'm just glad I didn't hurt my back. By the time all this was done, it was probably already 5pm - we knew we had a couple hours of daylight left, but still a late start by any measure - we were all prepared to spend 2 nights out and weren't worried about the time. The rapids below here were pretty straightforward. We hit Mumford ledge and decided we had already had a long day and portaged (my only portage of the run). We had a couple other great rapids and then I was anxious to start looking for a campsight - I hate the idea of boating hard rapids in the dark looking for anything resembling a camp. We found a gravel beach that was far from the perfect camp, but a lot better than most of the river bank through most of what we had seen so far. We all moved our gear up to somewhat higher ground on the shallow bar as the water rose a bit that evening. 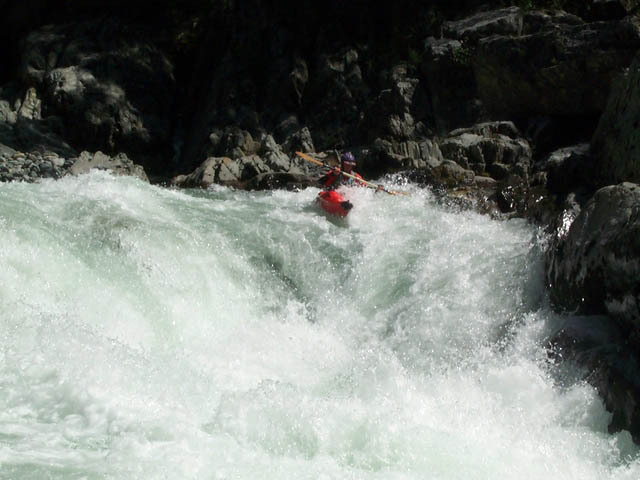 There were a number of excellent rapids through some small shallow gorges but the "event" we were looking for and looking forward to was Dream Gap. There was a big rapid that I would say was just above the gap itself, but could be considered part of the same sequence, making for a total of 4 drops. The first one was very straightforward. The Dream Gap itself is 3 rapids. Each is pretty tricky. The first involves a steep 5ft ledge, and a tricky midstream boulder. The second involves a move where you must surf a big 4ft crashing wave, peel out to drop down 15ft of tongues and crashing waves avoiding a grabber hole at the bottom. The third is probably the cleanest, but it is also un portagable and hard to scout from up high above on the cliffs. Dream Gap behind us we knew there was only one other harder rapid on the run (though no shortage of good WW between) and that was F-14 just above Euchre Bar (the put in for Giant Gap). This was in incredibly fun rapid, that had an excellent steep tongue of green to rip down. Somewhere down stream we came upon a mine shaft that had a small creek diverted through it, and since we had pretty much agreed to spending another night on the river we could take our time and explore little side interests like this and the NF of the NF. Tom and I had just done Giant Gap earlier in the week, but the flow was higher and you could definitely feel it. I think you could almost say that overall, Giant Gap is more scenic than Generation, but thats a tough call. For our second night we found a giant sand bar (probably extended 30ft above river level). As Rocky said: "This must have been one hell of an eddy" Above the bench where we camped we found an unused but relatively modern miners camp. Lots and lots of mining activity in this region, both historical, and modern hobbyists and wackos. It was very nice to be able to take the leisurely pace of a 3 day, and to spend an extra night on the river. I won't say much about Chamberlain falls, it is a super fun run with easy access. There are more undercuts on this 4 miles than in all the miles above combined and I'm suprised its rafted commercially with such regularity. We ended up boatscouting the whole thing - the rapid Chamberlain Falls is a fun slide. There was another not far below that which all the rafters were scouting and which we all just bobbled down and then watched some good raft carnage. We also had a great old school ender session at something that might be called "Nose Stand" spot. When we got to the take out it must have been in the 90s easily, where as the day we put in the temps around the area were probably in the lower 70s. The following week the NF continued to climb up towards 3000cfs. A spectacular section of river overall. Although I won't be in a huge hurry to do that Generation Gap hike again, I could run Giant gap over and over, and I'd like to see what its like at even a little higher water - I'm sure it stomps.